It’s that time of year again, and I’ve been sewing up an adorable army of the undead. 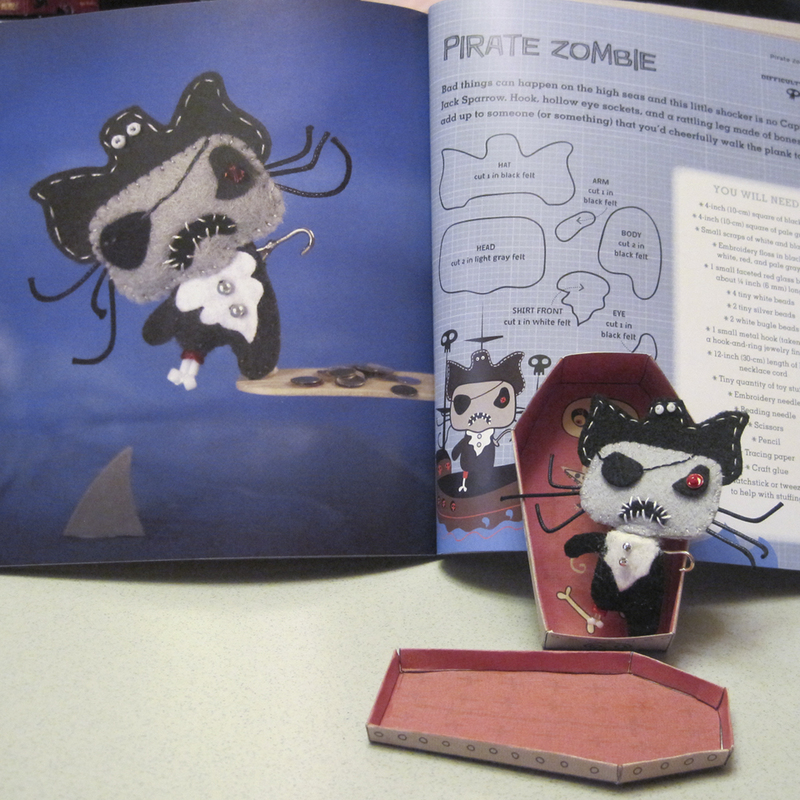 Last year I reviewed the book Zombie Felties and made the Classic Zombie. That pattern had a difficulty rating of 2 skulls. 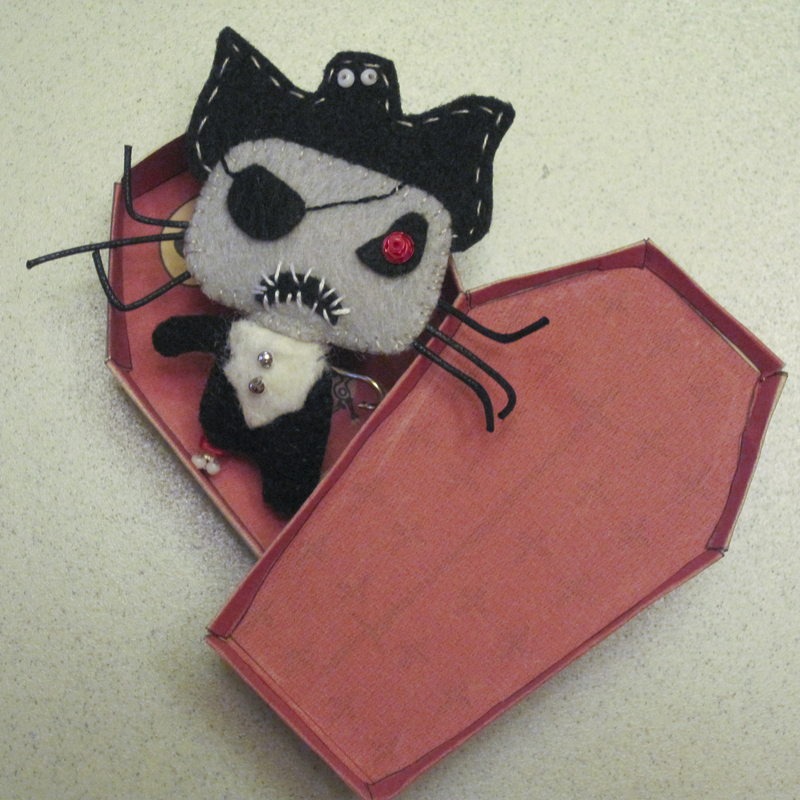 This year I made a Pirate Zombie (pictured above) at a rating of 3 skulls, and the Zombie Kitty at a rating of 1 skull. I actually felt that the Pirate was a bit easier to construct than the Classic. I concede that may be because I had a little more experience in making them at that point, but I also noticed there were fewer beads involved in the Pirate’s construction, and I think all the little bandages on the Classic made it a little fussier. I did not have the right size red bead for the Pirate’s eye, but I did have on hand some red sequins and a red seed bead. I’m pretty happy with the results. That was my only real substitution, apart from the hook, which is just a piece of bent wire. Super easy. The Kitty was appropriately 1 skull because it was very easy to put together. The photo in the book does not reflect this, but there is a drawing on the following page that depicts the eyeball collar decoration as being bloodshot. I used a fine-point sharpie to add the red squiggles to the white bead. I did not use pale green felt as directed in the book, because I couldn’t find any. I think the gray works just fine. Speaking of the actual felt material, there is one consistent piece of advice I would give for making any of these: try to find eco felt. It is made from recycled plastic bottles and it is more firm than regular felt. I wouldn’t use it for anything really cuddly, but for decorative purposes it makes life a lot easier. 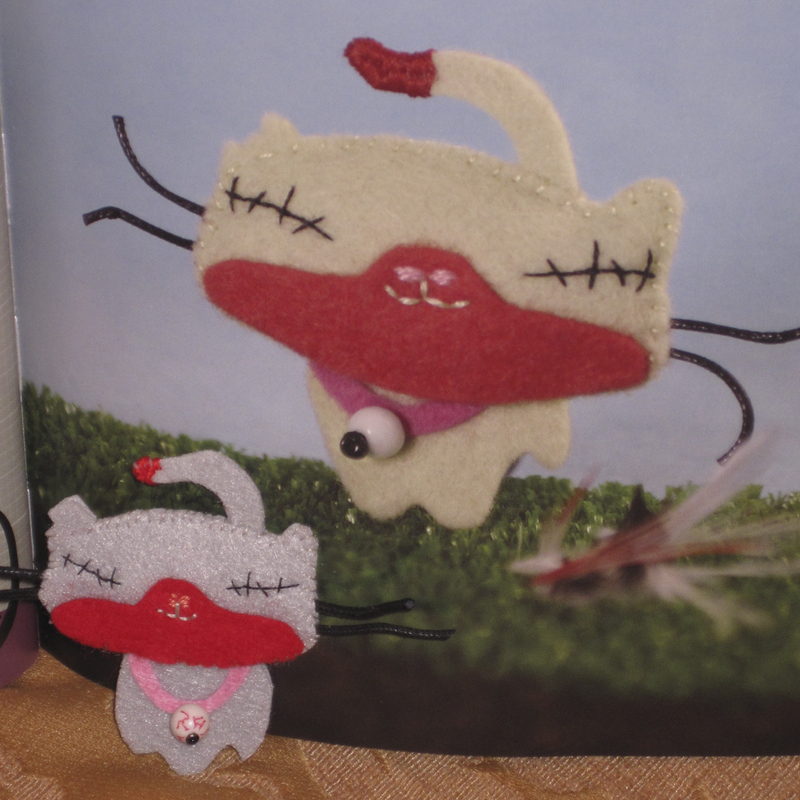 The Zombie Felties projects involve lots of teeny-tiny pieces of fabric, and with lots of handling the felt can start to come apart. Eco felt will not fall apart when cut into tiny pieces. Since it is nearly Halloween I expect my next project will be a costume. I hope I can find some spare time!